Portland's landmark Time and Temperature Buildings, at 477 Congress St., recently failed a city fire safety inspection. State certificates posted in the Time and Temperature Building. PORTLAND, Maine — An office tower that defines the skyline of Maine’s largest city recently was found to lack legally required sprinklers and smoke detectors on many of its floors. Earlier this month, Portland officials informed the Maryland-based finance company that owns the iconic Time and Temperature Building that its property failed a safety inspection. During a Nov. 3 inspection, fire department officers found 19 life safety code violations in the 14-story building, including that six floors lacked required sprinklers and that “multiple floors” did not have smoke detectors in hallways. The failed inspection comes as the latest challenge for the once grand Congress Street tower, which had been hemorrhaging tenants and had fallen into disrepair even before it was foreclosed on last year. 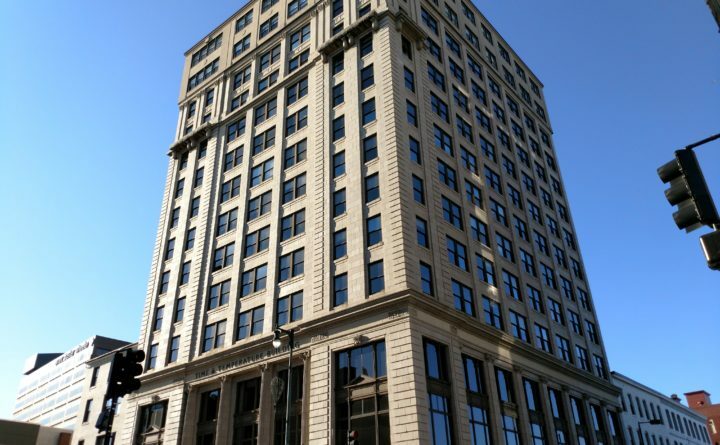 To some of its occupants, the failed inspection is indicative of years of deferred maintenance and the indifference of the building’s new owner, CWCapital Asset Management, to its tenants. CWCapital declined to comment for this story. NIA Hunneman, a Boston company that manages the Time and Temperature Building, did not respond to requests for comment. In addition to the sprinklers missing from the basement and the 11th, 10th, eighth, fifth and fourth floors, a report from the inspection cites an array of other fire and safety hazards. Issues include loose wiring, broken emergency lighting and blocked or sealed emergency exits. The report also states that many fire alarms and fire extinguishers throughout the building lacked current inspection stickers or had expired. 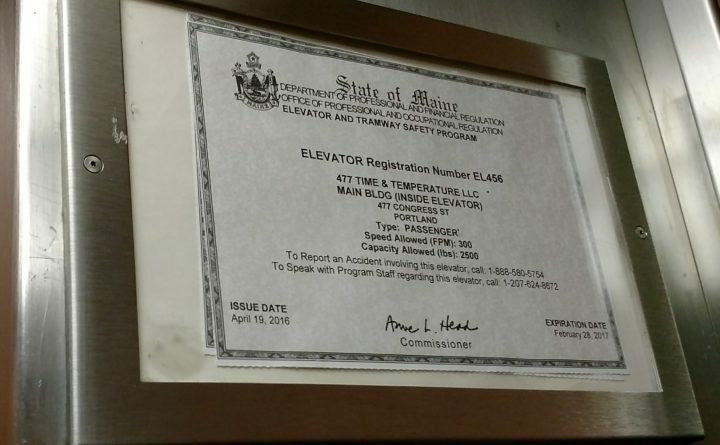 State inspection certificates seen Monday in the building’s two working elevators expired in February. The fire department inspected the building after receiving a complaint from a tenant and is working with its owner and manager to develop a timeline to correct the violations, according to Assistant Fire Chief Keith Gautreau. “We take all these [violations] seriously, and they’re going to have to work with the fire prevention bureau to bring the building up to code,” Gautreau said. The fire department has not seen the need to involve the city’s lawyers, as it does in the most concerning cases, Gautreau said. He added that it would likely take time to install sprinklers but that the city expects other code violations to be fixed more quickly. Several tenants said that despite the issue they still feel safe in the Time and Temperature Building. Over the past two weeks the property manager has had crews in to check smoke detectors, according to Depke, president of the internet marketing firm Spire Express, and another tenant who declined to give her name. The masonry tower is at less risk of a fire than many of Portland’s old, wooden buildings, according to Paul Bulger, a lawyer who keeps an office on the 11th floor, but its shabby condition has become a turnoff for his and other business owners’ clientele, he said. Other tenants have fled the Time and Temperature Building in recent years, or are trying to find other office space in Portland’s relatively crowded commercial real estate market. Empty offices were visible throughout the downtown tower Monday, some with plastic packing crates, cardboard boxes and rolls of tape still littering the floor. Before it went into foreclosure and was purchased by CWCapital, the building’s occupancy rate had fallen to around 60 percent, according to documents obtained by the Portland Press Herald. Bulger estimated the building is half-empty. Follow Jake Bleiberg on Twitter: @JZBleiberg.